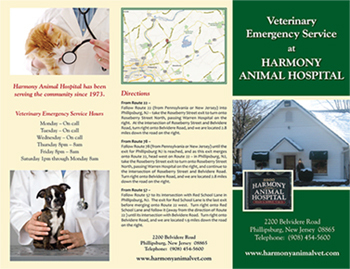 Harmony Animal Hospital is a 24 hour general and emergency veterinary practice located in Warren County, in Phillipsburg, NJ. Harmony Animal Hospital specializes in small animal health care for dogs, cats, rabbits, ferrets, hamsters, and other small, furry creatures. Our mission is to provide our patients the most advanced and compassionate veterinary medical, surgical, dental, and emergency care while affording the best possible service to our clients. From routine vaccinations and wellness exams to comprehensive medical and surgical practices, we are prepared to meet any health care needs that arise for your pet. New Patients: Download and fill out our Intake Form. Our work on emergency is facilitated with appropriate diagnostic and therapeutic equipment. Whether the nature of your pet's emergency concern is medical or surgical, Harmony Animal Hospital's emergency services are available and enabled. At Harmony Animal Hospital, we treat your pets like the valued family members they are.